Bogadent Dental Water Additive reduces adhesion of bacteria to teeth and has an anti-bacterial effect, reducing the risk of plaque and tartar. Bogadent Dental Water Additive reduces adhesion of bacteria to teeth and has an anti-bacterial effect, reducing the risk of plaque and tartar. Dental Water Additive is simply added to drinking water and is well accepted by dogs. Add the daily amount, depending on the weight of your dog, to drinking water. Change the drinking water every 24 hours. Bogadent Dental Water Additive is easy to dose, using the measuring cup supplied. Shake before use. 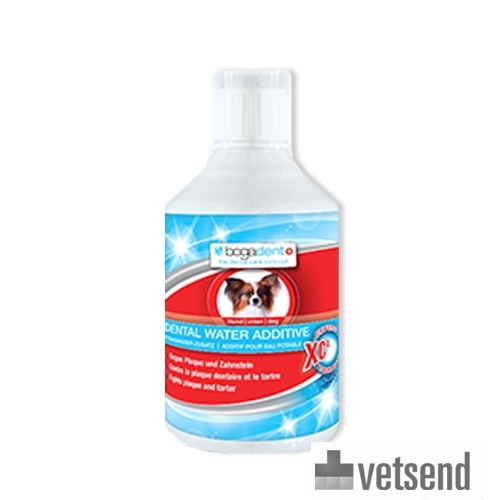 Have you used Bogadent Dental Water Additive for Dogs before? Let us know what you think about this product.